A. Leva, E. Locatelli, and R. Scattolini, Workbench Techniques in the Design of Digital Control Systems. A. Barreiro, Recursive Techniques in State-Space and Matrix Fraction Realizations for Linear Systems. P.H.Bauer and E.I. Jury, Bounding Techniques for Robust Stability of Time-Variant Discrete-Time Systems. X.R. Li and Y. Bar-Shalom, Performance Prediction of Hybrid Algorithms. W.-Y. Yan and R.R. 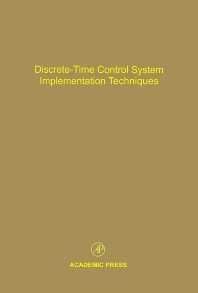 Bitmead, Decentralized Control Techniques in Periodically Time-Varying Discrete-Time Control Systems. R.R. Bless and D.H. Hodges, A Finite Element Method for the Solution of Optimal Control Problems. H.-Y. Chuang and C.-H. Liu, Techniques in Cross-Coupled Digital Adaptive Feedrate Control for Multiaxis Machine Tools. C. Wen, Globally Stable Single Loop and Decentralized Adaptive Systems with Parameter Projection. Subject Index. These papers cover the recent advances in the field of control theory and are designed for electrical engineers in digital signal processing.